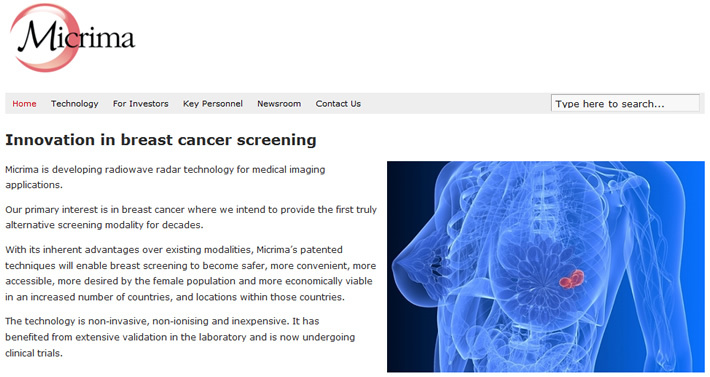 Micrima, the Bristol company developing a safe, low-cost way of improving breast cancer detection, has gained CE marking for its MARIA (Multistatic Array processing for Radiowave Image Acquisition) product, paving the way for further supportive clinical trials in the UK and expansion into Europe. This European regulatory approval is a significant milestone for the company, originally a spin-out from the University of Bristol, enabling it to stage further supportive clinical trials in preparation for heading its ground-breaking system towards the European market. The non-invasive technology is on track to provide the first true alternative to X-ray mammography for decades. The company is now in the process of strengthening its development team in Bristol in order to further advance the MARIA system’s capabilities and broaden its potential application areas. It is preparing for a further finance round, to close later this year, in order to fund this expansion. The MARIA technique uses an innovative radar system developed from original buried landmine detection effort out of the University of Bristol. The system not only promises to be safer and cheaper than current breast screening methods, it should also provide more reliable results in younger women, whose denser tissue is a significant challenge for current screening methods, with the additional benefit of being more comfortable for women undergoing the test. Previous clinical trials have taken place at Bristol’s Southmead Hospital, which will continue to be at the heart of the broadening trial base. Breast cancer is the most common cause of death in women between the ages of 35 and 55 in Europe and the leading cause of death in many countries. Early diagnosis dramatically improves survival rates, yet most tumours are not discovered early enough – particularly in younger women who have denser breast tissue. Micrima is based in Bristol’s Engine Shed innovation hub.